Celebrating Six Years Of Podcasting - Be A Part Of It! On July 24, 2005, the current edition of The Bobby Blackwolf Show went on the air for the very first time. 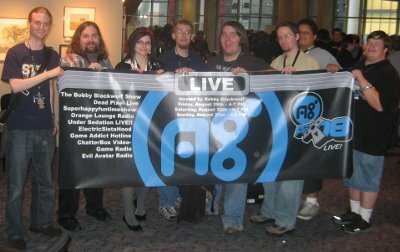 Before Ustream and Justin.tv, before services like BlogTalkRadio, we took live chat comments over Internet Relay Chat (IRC) and live calls over Skype (a relatively new technology at the time) while broadcasting over a Shoutcast stream. Six years later, this is the same way the show is broadcast today, even with the advances in streaming technology. Why change what works? This Sunday, I'll be celebrating six years of podcasting. I never really thought I'd be doing this thing that long, it was a fun hobby. I always wanted to do radio (or something on the air) but it wasn't something I was going to be able to do professionally, due to me having a Computer Science degree and being a software developer at my day job. I turned down an opportunity to college radio and that was one of the biggest regrets of my life. So, thanks to Scot Rubin and the All Games Network, I was given a chance to make up for what I missed. 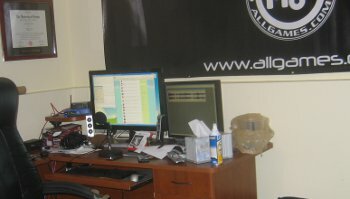 I was the first weekly show on All Games Radio, and went continuous for 147 straight weeks without missing an episode. I honestly don't remember what it's like to have a Sunday night free anymore...I think a part of my life would be empty if I didn't spend an hour locked in my basement office/studio. Since starting the podcast, an entire new generation of consoles have been released, social games and even social media has risen, a new genre of game has been made popular (and then died) and we've moved closer and closer to those old AT&T You Will ads from 1993. In my personal life, I have changed jobs twice, bought my first house, left a long personal relationship, attempted to do internet video, and started becoming a semi-professional musician. I can't say that I lead a bad life. Broadcasting from the Arena Interactive Loungs at E3 Outpost 2006 - Including the first ever on-air meeting with Orange Lounge Radio. Gamerpics on Xbox Live - before the NXE, you could get the logo for this show and a lot of other All Games Radio shows for free on Xbox Live. Interviewed PnP pioneer Andrew Greenberg who even talks about Street Fighter: The Storytelling Game that he helped develop. I have also been able to meet many people off the air that I greatly respect, and I enjoy catching up with them at events I am able to attend because of the podcast. But honestly? The best part is on Sunday nights, and talking with all of you. Whether you've been in chat every week since the beginning or you just joined for the first time last week, I thank you. I hope that I have entertained you at least a little bit over the last six years, and I hope to entertain you a little bit more. Be A Part Of The Anniversary! This Sunday, I'll be looking back at my experiences but I also want to hear from you. You can attempt to leave a voicemail - however Skype is not delivering all my voicemails for some strange reason - or you can send an MP3 to bumpers at bobbyblackwolf dot com. State your name and your favorite memory of The Bobby Blackwolf Show, or why you listen, or anything else. I will be montaging all of these together on the show this Sunday night. I will also be taking calls for the entirety of the show, so if you don't get a chance to get anything in early, you will still have a chance to call in. I hope to see many of you live on Sunday, July 24, 2011, at 8PM ET/5PM PT on All Games Radio. Who knows? Maybe you'll make it to ten years, too?!! But congrats on 6 years so far! Looks like there is a problem with Skype with respect to me receiving voicemails from other Skype users. If you call 1-888-36-GAME-1 from a cell phone, I'll be able to receive your voicemail just fine. I have a trouble ticket with Skype sent in to hopefully get this resolved.